The shutdown crisis raging in Washington. The Colorado legislature getting down to business in Denver. 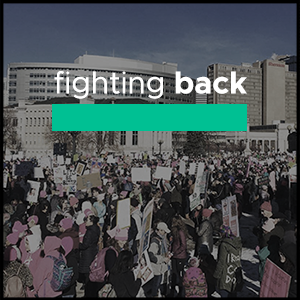 A huge backlog of progressive priority legislation to pass after years of divided government in Colorado, and accountability for Republicans in Washington like Cory Gardner as they continue to enable President Trump’s destructive agenda. This isn’t just an opportunity to make a difference. Our country needs every conscientious American to seize this moment, to continue building on the momentum of 2018 locally and nationally: as we reclaim our public institutions, and develop solutions to the solvable problems that partisan gridlock has prevented us from addressing for years. With the federal government shutdown and no compromise in sight, we are proud to open our studio to offer free podcast support services to any furloughed federal employees looking for a side hustle or an engaging way to pass the time. Kicking off this special offer, we are hosting an open house for all pod-curious furloughed federal employees on Tuesday, January 22, from 4-6 pm. Every person who attends will receive an orientation on how to use the recording studio, a Podcasting 101 workshop, and a free month of membership at House of Pod, which includes unlimited first-come, first-served access to the recording studio. Coloradans For Immigrant Rights: January Spotlight on! We will be holding our January Spotlight On on January 22nd at 5PM. Welcome to the 2019 Legislative Session. There is some great pro-immigrant legislation that will move forward in Colorado in the upcoming legislative session. Join Black & Pink Denver and the Incarcerated Workers Organizing Committee for the 3rd annual Trans Prisoner Day of Action & Solidarity. This grassroots project was initiated by Support Marius Mason, a trans prisoner in Texas, US. This annual event is being led by trans prisoners and their supporters from around the world. It is a chance for those on the outside to remember those behind bars, give real solidarity and support and raise awareness about issues facing trans prisoners. It is a chance for those on the inside to have a voice and organize together. Girls Rock Denver and Keep Abortion Safe Present: Rockin’ For Roe with ORYX, Rotten Reputation, church fire! Come rock out with us on the 46th anniversary of Roe v. Wade. Proceeds will benefit Keep Abortion Safe and the Women’s Freedom Fund. Do you work with, advocate for or communicate about older adults, aging and ageism? Are you a policy-maker who cares about older adults and wants to advance age-friendly communities? Are you someone who simply cares about addressing ageism? If so, this workshop is for you. Colorado Coalition for the Homeless: Can We Fix the Affordable Housing Crisis? In response to the housing crisis impacting nearly every part of Colorado, this panel will address the widening gap between affordable and available housing options in our state. This first panel discussion of 2019 will look at who is struggling to afford housing, who remains unhoused, and bright ideas to remedy the most critical need of our time. Have you ever wanted to learn more about the Colorado legislature and how it works? We have the training for you! Join us to learn how the legislature works (we mean how it really works) and how to advocate for policies you care about. We will also preview what legislation we expect to see during session! Our location will be at the Ford-Warren Branch Library. There is a parking lot and plenty of free street parking. Join the Grasslands team for this compelling conversation on the future of #cannabis journalism, spanning the influential microcosm of Instagram influencers to the important role of the mainstream media. Featuring The Denver Post Editor-in-Chief Lee Ann Colacioppo, Marijuana Business Daily Founding Editor Chris Walsh, Denver Business Journal Associate Editor Jonathan Rose, Associated Press cannabis reporter Katie Foody and other leading journalists and influencers. Moderated by Grasslands Founder and CEO Ricardo Baca, himself a veteran journalist with more than 20 years of experience at daily newspapers. The Denver Women’s Chorus celebrates 35 years of building community through music with this special concert celebrating strong women throughout herstory including Malala, Ruth Bader Ginsberg, Harriet Tubman, and more! Join Emerge Colorado in welcoming our 2019 Class to the community on the first day of their training! We would love to see our alumnae, friends, partners, and allies there to meet the 25 new cohort members, say hello, and have a drink! March for Housing Justice – Renters’ Rights Now! Colorado has skyrocketing rents and some of the worst renter protections in the country. Many of us live in unsafe and unhealthy rental units because Colorado law favors landlords over renters. 1 in 4 Colorado renters spend more than 50% of their income on housing. As rents get higher and higher, more people are forced to leave their homes and neighborhoods. For those still fighting to stay, laws favoring landlords make it hard for renters to make complaints or organize without fear of retaliation or eviction. For our first Community Meeting of 2019, BLM5280 is inviting our community to join us on Saturday, January 26 from 3-5pm. We look forward to sharing what we’ve been up to and preparing for the upcoming #BlackLivesMatterAtSchool week of action! We will also be talking about the the work of our economic justice and community response squads! Colorado deserves a senator who will represent the people, not special interests, or the party of Trump and the culture of greed and corruption. We’ll have conversation, light hors d’oeuvres, beverages, and then the three candidates will have time to address the group about the issues most important to them.